Although tiny, the baby was very brave, and didn't flinch when touched by human finger that was about as long as its whole body. It is not clear whether Zoë has two babies. She has subsequently visited on another three occasions with a single baby, however this baby looks different to the first one. Compare the amount of white on the tail of this one to the photo above. 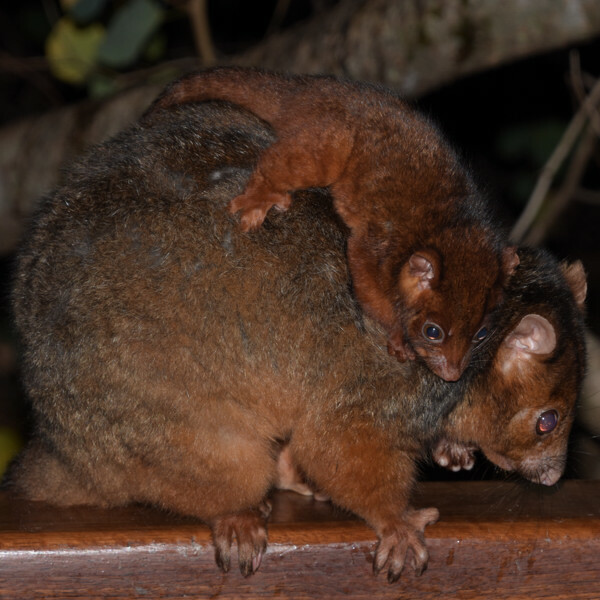 Normally ringtails have two babies at a time and normally a mother ringtail with babies of this age will carry both of them on her back, however it is not unknown for a mother ringtail to leave one or both babies alone in the nest for part of the night. 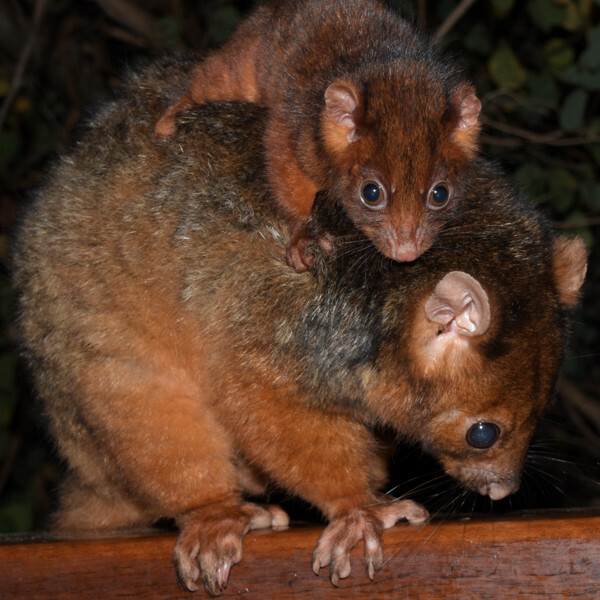 Also, father ringtails will often look after babies. Zoë has visited a few times without any babies during this period so she is definitely leaving at least one of them elsewhere, but the question of how many she has won't be resolved unless we see two babies at the same time. 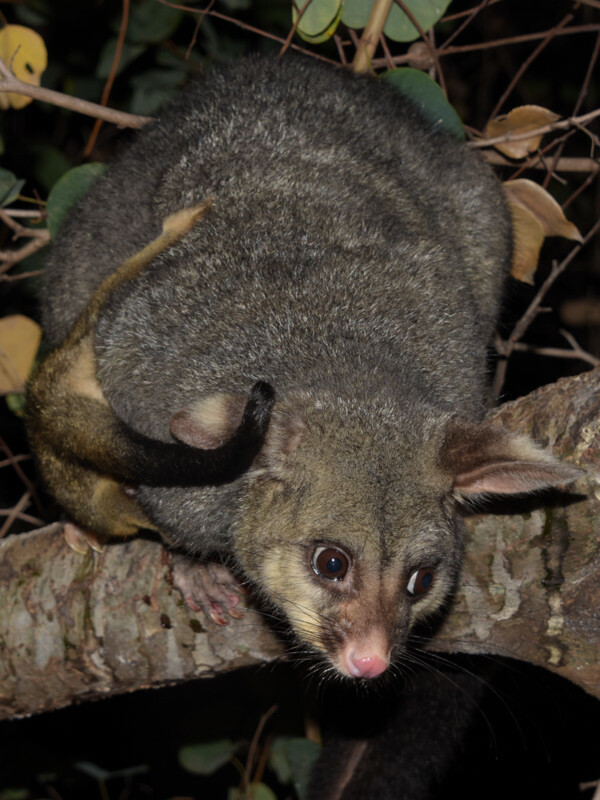 There is an unknown female who has now been seen twice and who doesn't seem to correspond to any known possum in the area, and a male who might or might not be Akira. The male looked exactly like Akira but ran off in fear when presented with food, which is very unlike Akira. It's possible that Akira, who is becoming an adult, is in the process of being chased out the area and is now behaving a lot more cautiously. 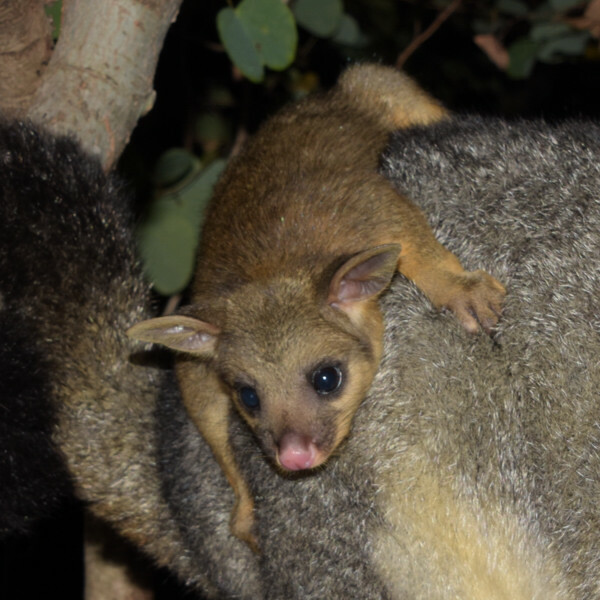 I also belatedly posted a couple of ringtail possum videos on the YouTube Channel. This first is from January of this year and shows Akira as a baby learning how to negotiate the balcony wire, which can be a difficult obstacle for young ringtails. The second shows Zoë grabbing and biting Koji's tail as he walks by. I'm not sure if she's being playful or was just in a bad mood at the time. But it might also be that Koji's tail is tasty in some way. A couple of days ago, Sasha grabbed and bit Koji's tail when he was sitting above her in a tree. Unfortunately there were no photos of film taken of this incident. Sasha has so far brought her new baby over once to show the humans. The baby is a little boy possum - all seven of her (known) babies have been boys. 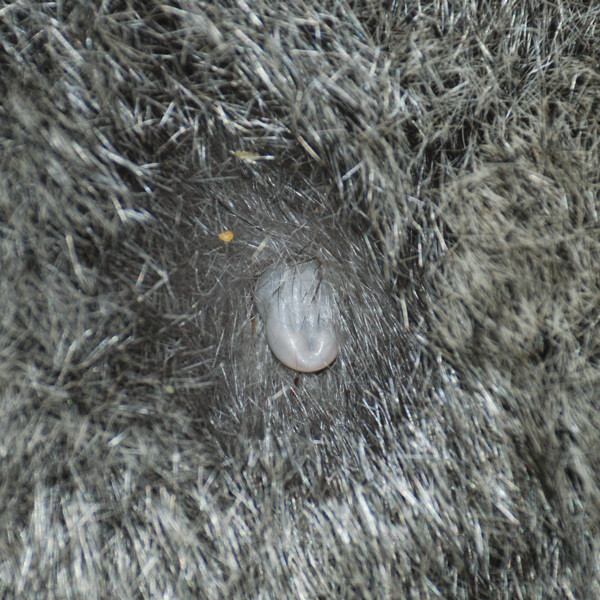 The baby is at the stage where he leaves the nestbox riding on Sasha's back, but later retreats into her pouch. He will soon be too big to do this and significantly hampers Sasha's movements when in her pouch. 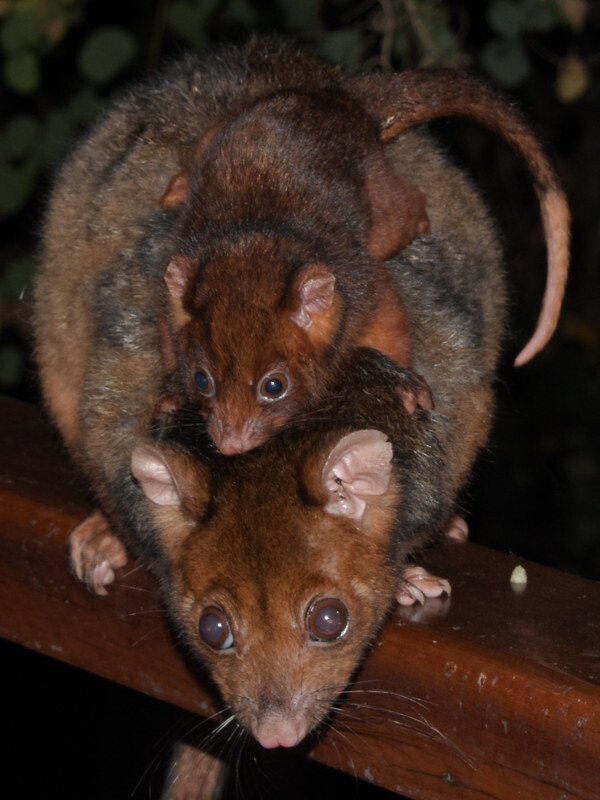 When baby brushtails are first back-riding, they are often very awkward and hang on at odd angles. Here is a photo of the little one hanging onto Sasha's side with his tail wrapped around her ear. Tarzan has not been seen in a while and might have been chased out of the area permanently. When last seen, he had a tick on his back. Although dangerous to dogs and cats, ticks aren't a problem to possums unless they get in an eye or something. Other than this, Tarzan was in perfect health and is large for his age, so he should be in good condition to go out on his own. There has been a possum sleeping in Box 2 for a while now. I had originally thought this might be Tarzan, however there has also been a new male seen in the area, and it's quite likely that this possum is now using the box. The new possum is somewhat smaller than Marlowe, who now hasn't been seen in a while. The brush turkeys have been busy in the yard. There is a male with a large yellow wattle who has been raking leaves from all over the garden onto his mound. I had originally assumed he was Gatsby, however he looks different from Gatsby when last seen and seems to act somewhat differently. To complicate things further, it's also possible that the turkey I was calling Gatsby last year was not in fact the Gatsby from the previous year - the first Gatsby was quite aggressive in protecting his mound from humans in a way that neither of the two subsequent Gatsby's have been. Anyway, this male turkey will now be called Merlin. He has at least one female with him and they may recently have been mating. Yesterday, the female - who has been named Sabrina - was seen excavating a hole in his nest and kicking dirt over him so vigorously as to almost bury his head. I think she is checking out his mound for egg-laying purposes. If all goes well there should be brush turkey chicks emerging this summer. I love how comprehensively you've documented the lives of these delightful animals. I check the cameras from time to time! I myself feed four possums who come by every night. 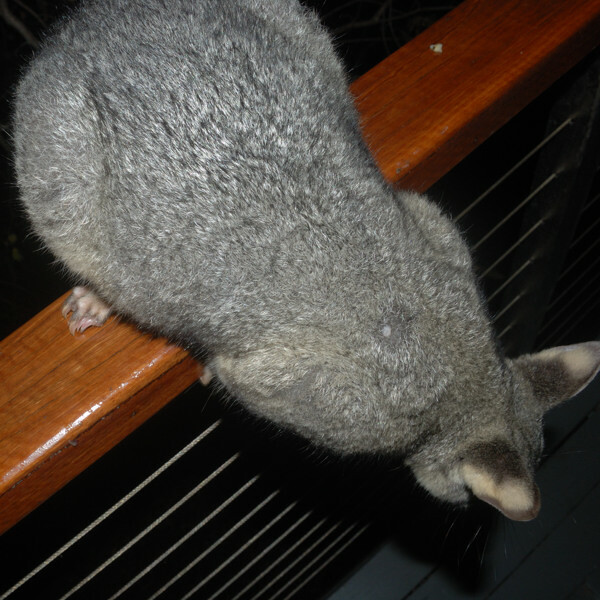 What I find interesting with your possums is that, compared to the ones at our place, they seem to live rather irregular lives. The ones here have basically fixed routines; they never are away for a night and even the times at which they arrive are more or less predictable. One of my concerns, however, with my leaving a substantial amount of food out nightly is that it seems to have made one of the little ones (a male whose mother kicked it out a couple months ago) almost totally dependent on it: he basically spends the entire night within two or three meters of the feeding station. I worry that he'll be lost if I should stop feeding him for whatever reason. I love how distinctive their personalities are! the mother of the group I have here allowed herself to be petted from the first time I saw her: but another of the possums, who has seen me put out food every day for a year, bolts if I come within four meters. Thank you for commenting, it's good to see that there are people out there who like possums and also enjoy this site. 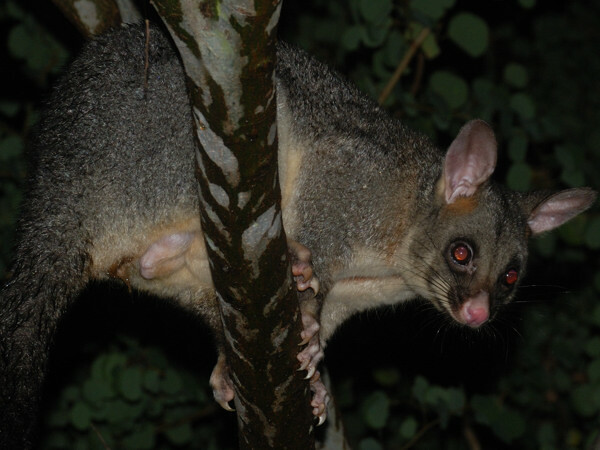 Some of our possums have had fixed routines for periods of time; often a possum will come every night at the same time for several months. But then the routine will suddenly change. Sometimes there will be an obvious reason, such as a python hunting in the area, but often the reason is not clear to mere humans. 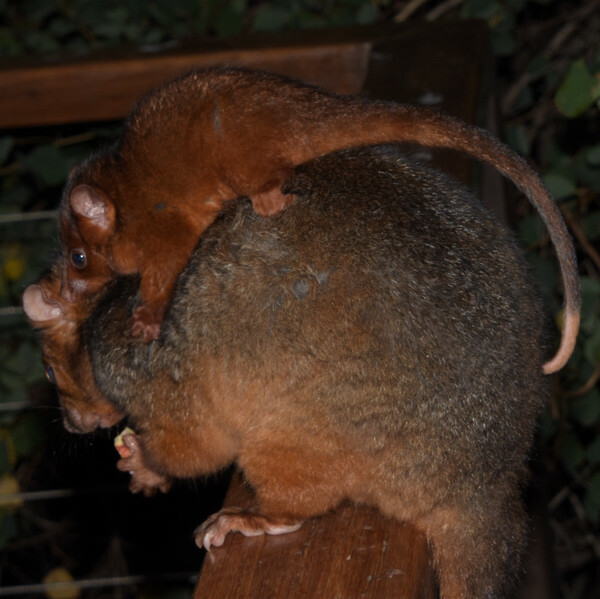 I'm not sure if this is what's happening with your young male, but sometimes we've seen that after a possum becomes independent, but before they leave the area, they will try to score extra food. It might be that they stand a better chance of survival if they bulk up when they have the chance. Possums are very adaptable and while your possum might have a taste for human food, he will most likely be able to switch to other foods should he have to leave. In nature, possums have to deal with seasonal variation of food sources as well as droughts and so on, so they're pretty resilient as far as this goes.